Play your favorite classic card game, Spades, online or offlineanytime!Prepare for some card playing, Spades laying, point slayingaction!Now you can play Spades online or offline anytime you haveyour mobile device in hand! This fantastically cool Spades gamebrings you fantastic graphics, awesome effects, and some down ndirty Spades competition that will have you coming back again andagain! Brilliantly designed and expertly created for both seriousSpades players and casual card players alike, Spades Pro is perfectfor card players of all types. Complete with offline mode, thiseasy to learn card game lends itself nicely seasoned Spades playersand new players! Join the table and start the fun with SpadesPro!Spades Pro Features:• Fun card game• Great Spades game• Onlineand offline modes• Awesome graphics and effects• Brilliantlycreated Spades game app• Card playing at its finest is what you canexpect• System Points for playersPlay Spades Pro online or offline.It’s the Spades game you can count on! Summary: Whist is a simple trick taking game, played in pairs. Theplayers sitting across from each other are a team and together theytry to get as many tricks as possible. Bid Whist is a comparativelynew game of the Whist family. In certain regions, it has gained aconsiderable following. Since then, some of the rules have changed.Features:1- Beautiful design and animation.2- Easy and fast tolearn and play.3- Smart robots.4- 2 Engines with different rulesand difficulties.5- Facebook and online version is coming soon. Euchre is a trick-taking card game most commonly played with fourpeople in two partnerships with a deck of 24 standard Euchreplaying cards.Euchre is the game responsible for introducing theJoker card into modern packs;this was invented around 1860 to actas a top trump or best bower.Euchre believed to be closely relatedto the French game Écarté that was popularised in the United Statesby the Pennsylvania Dutch, and to the seventeenth-century game ofbad repute Loo. It may be sometimes referred as "Knock Euchre" todistinguish it from Bid Euchre.Features:1- smart robot.2- easy tolearn and fast.3- beautiful design and sounds.4- Facebook is comingsoon. This game is Spades card game. Play the famous Spades plus againstopponents simulated by advanced artificial intelligence. Now playSpades. It is known ace of spades and also spades offline. PlaySpades offline. Spades free brings this classic 4-player contracttrick taking card game to Google Play, created to the same highstandard as the rest of our games, Spades plus supplies classygraphics, super smooth gameplay, highly scalable difficulty &much more! Play Spades free. Spades download. You can use thisfeatures in this Spades Offline. Spades Features: Google Game PlayService, Achievements, Score and Win Leaderboards, Quests, Levels,Stats. Spades Settings: Bidding modes: Standard, Whiz, Mirror,Suicide, Trump Cards Options: Ace-High, Joker-Joker,Joker-Joker-Deuce, Joker-Joker-Deuce-Deuce, 10 Bag Penalty option,Nil Points option, Blind Nil option, Game Speed, Card Size, CardDeck Selection, Game Finish Score, Card Movement; Drag & Dropor Click, 12 Avatars selection, Customise player names, Spades plusdesigned for tablets and phones - You can play spades online withfriends by installing our Spades Online game. Spades, Spades plus,Spades download, play spades online, free spades, download spades,spades offline, spade, offline spades, download spades offline,play spades offline, play spades game, play spades card game,spades free card game, spades free, spades card game, ace ofspades, spade, spades game, online spades, spades online, playspades plus. ★ Top Developer (awarded 2011, 2012, 2013 and 2015) ★ ★★ Ourbiggest upgrade: May 2017. See end of description for full details!★★ Spades Free has been substantially updated and is now muchstronger, with a new bidding system. Its new game intelligenceallows it to make creative plays that conventional programs cannotmake, often breaking the usual rule-of-thumb to find new winningplans. The new CPU players will now also talk to each other - andyou - in speech bubbles and smile or frown to let you know how theyfeel! Spades Free brings this classic 4-player contract tricktaking card game to Google Play. Created to the same high standardas the rest of our games, Spades Free supplies classy graphics,super smooth gameplay, highly scalable difficulty & much more.Spades has never been so good! Featuring: ★ Full Spades PartnershipPlay ★ 21 CPU characters of varying skill (beginner to expert) ★NEW! 3 new CPU characters ★ NEW! Option to have CPU characters chatduring play! ★ NEW! A new bidding system allowing a more creativegame! ★ NEW! Set your own name! ★ Choose your Spades partner andwho to play against, or go random! ★ Select from 17 differentbackgrounds or use your custom background! ★ Human and CPU playerstats! ★ Undo & Hints ★ Game Rules & Help ★ Designed forboth Tablet and Phone ★ Jokers, Barmore, NYC and Deuces available ★In-game score help: tap end-of-hand scores for explanations ★ "Promode" option for stronger play ★ "Speed Play" option for fast games★ "Aggression" option to make all CPU players bid more aggressively★ In-game displays to help player track rules in use Summary ofmajor new engine work completed in this new version: 4 years afterthe original release of Spades Free, we are happy to announce oursingle greatest improvement in play quality, after a prolongedperiod devoted just to Spades. This has always been a collaborativeproject shared with York University and has combined the best of AIresearch with game industry engineering to achieve the best resultso far. In this last period particular attention was paid tobidding and the Nil game, but we also made substantial progress inthe Joker variants and efficiency of the analysis. We believe thatthe end product was worth it. Discover the updated play foryourself! We are looking to add more great features and gamevariants for Spades Free. Watch this space! This free version issupported by 3rd party ads. Ads may use internet connectivity, andtherefore subsequent data charges may apply. The photos/media/filespermission is required to allow the game to save game data toexternal storage, and is sometimes used to cache ads. Play Spades plus smart AI opponents simulated by advancedartificial intelligence. This card game brings this classic4-player contract trick taking spades card game to Google Play,created to the same high standard as the rest of our games, Spadesplus supplies classy graphics, super smooth gameplay, highlyscalable difficulty & much more! Play this card game free. Itis known Ace of Spades. Play Spades offline. The top-ranked Spadescard game at now Google Play Store. Spades has Achievements,Leaderboards, Quests, Levels. Play and unlock achievements,complete quests and move to top rankings between millions. You canplay ace of spades free and also spades offline. Download Spades.Play Spades game. Spades Features: * Google Game Play Service, *Achievements, * Score and Win Leaderboards, * Quests, * Levels, *Stats. Spades Settings: * Bidding modes: Standard, Whiz, Mirror,Suicide, * Trump Cards Options: Ace-High, Joker-Joker,Joker-Joker-Deuce, Joker-Joker-Deuce-Deuce, * 10 Bag Penaltyoption, * Nil Points option, * Blind Nil option, * Game Speed, *Card Size, * Game Finish Score, * Card Movement; Drag & Drop orClick, * 12 Avatars selection, * Customise player names, * Spadesplus designed for tablets and phones - You can play spades onlinewith friends by installing our Spades Online game. Spades plus,Spades download, play spades online, free spades, download spades,spades offline, spade, offline spades, download spades offline,play spades offline, play spades game, play spades card game, playspades plus, spades online, spades free, free spades, spades plusfree, spades game. Fun spades card game, supporting both cutthroat and team play.Enjoy a smooth and beautiful looking game of Spades againstchallenging computer or human players. The game supports easycustomization of the opponents, game speed, rules and backgroundsso you can make it truly yours! Dont like to play with a partner?Then disable teams for a good round of cutthroat spades. • Free andfun online multiplayer card game. • Five star partners that cancover you NIL! • Challenging AI that doesn't cheat! • Rules:Normal, Normal with blind, Mirror, Whiz • Cutthroat or team based.• Achievements & leaderboards • Multiple deck shuffle methodoptions. • Rename players. • Customize the look and feel bychanging backgrounds and card styles. • Native tablet support •High resolution graphics. Customize the game with house rules like:• Teams • Breaking spades • Starting player • Bidding • Moon •Blind bidding • Point cards • Sandbagging • Jokers And a wholebunch of other options. Spades is a quick and enjoyable card game based on counting cardsand luck. 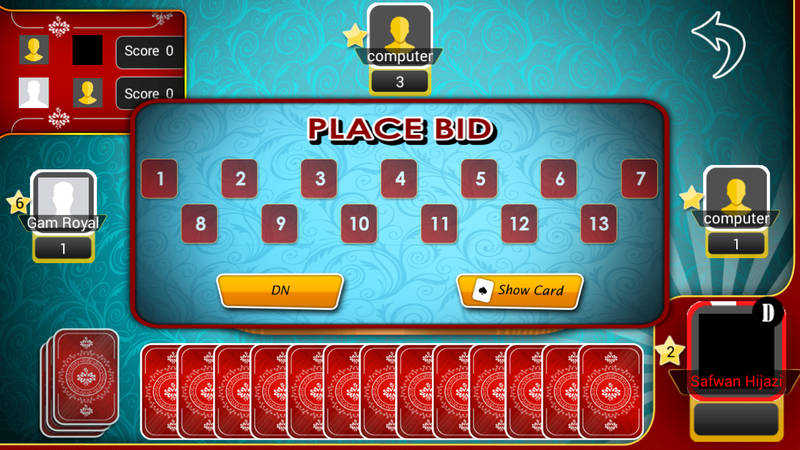 Users can enjoy with two different game modes that are ♠Classic Spades and ♠♥♦♣ Auction Spades considering highly uniqueAI. Users can reach new ranks, achievements while they areunlocking colorful backgrounds with entertaining game experience.The game graphics have been designed realistic for motivating usersto play more realistic game. We would be glad to see you as a partof this experience! (Offline Spades, Spades Free, Single PlayerClassic Spades Play Now, Trump Card, Best Spades, Royal Spades,Spades Scorekeeper, No Wifi Spades, Spades Card Game, Spades Mania)Other features that the game offers: - Totally Free Soccer ThemePacks - Classic Spades - Bidding Spades - Flexible Interface -Leader board - Achievements / Ranks - Best Artificial Intelligence- Free World Cup Themes You can also our other new games Under thename of Gamehook Studios.